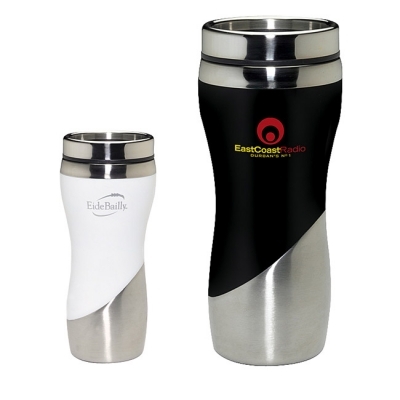 The curve tumbler has a ceramic look and is constructed with a stainless and acrylic exterior and with stainless liner. Minimum order with your imprint, 36. Quantity variation +/- 5% is possible & billable. This tumbler has a unique faux ceramic look. The lid is a sliding, stainless, and leak resistant one. Materials: Stainless and acrylic exterior with stainless liner. The price includes 1-color imprint, 1 location.